The ulimit command provides control over the resources available to the shell and/or to processes started by it, on systems that allow such control. 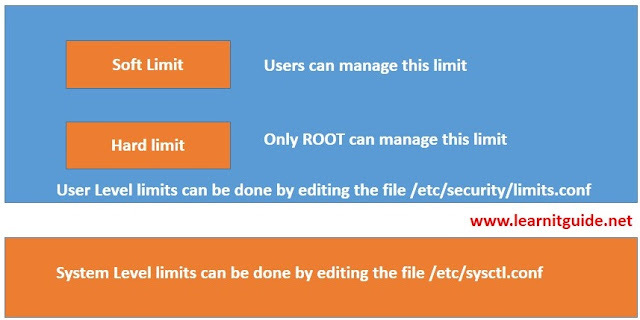 One normal user may utilize the complete system resources and system won’t be available for other users.So setting the limit to users is very important and you need to be very careful before granting shell limits to them.You need to be always make sure that system is not going out its system wide limit. For an example , if the maximum system process limit is 64K and if you grated process limit to 4 users as 24K. When these all four users try to use the maximum no of process, system will run out of its limit and you will see fork errors on the system. We can set up two limits as shown in the below image. Here we are going to see how to set the soft limit and hard limit to the users and also we will see how to increase the system limit. 1. Check the user shell’s soft limit ? Here my user is user1. 2. Check the user shell’s hard limit ? Here is the user is user1. 3. User can set their own soft limit ? Yes. They can able to set their own soft limit up to the hard limit value. Hard limit’s are managed by root user. You can reduce the hardlimit but you can;t increase being a normal user. You will get the below error, If you try to increase the hard limit from normal user. 4.How to increase the hard and soft limit value for user from root login? To increase the soft & hard limit values to the users, we need to edit “/etc/security/limits.conf” file. Here is the user1’s user’s configuration in limits.conf. After modifying the file, user need to logoff and login again to see the new values. 5.limits.conf file will be used to set the user level limit.Where to set the system level limits ? We have successfully changed the system-wide open files (File descriptor) value. You can also simply execute the single command to modify these value,but that change will not persist across the system reboot. Hope now you are clear with modifying the ulimit values for user and setting the new resource limit in sysctl.conf file . Leave your comment if you have any questions. Follow us to not miss any updates. Thank you.